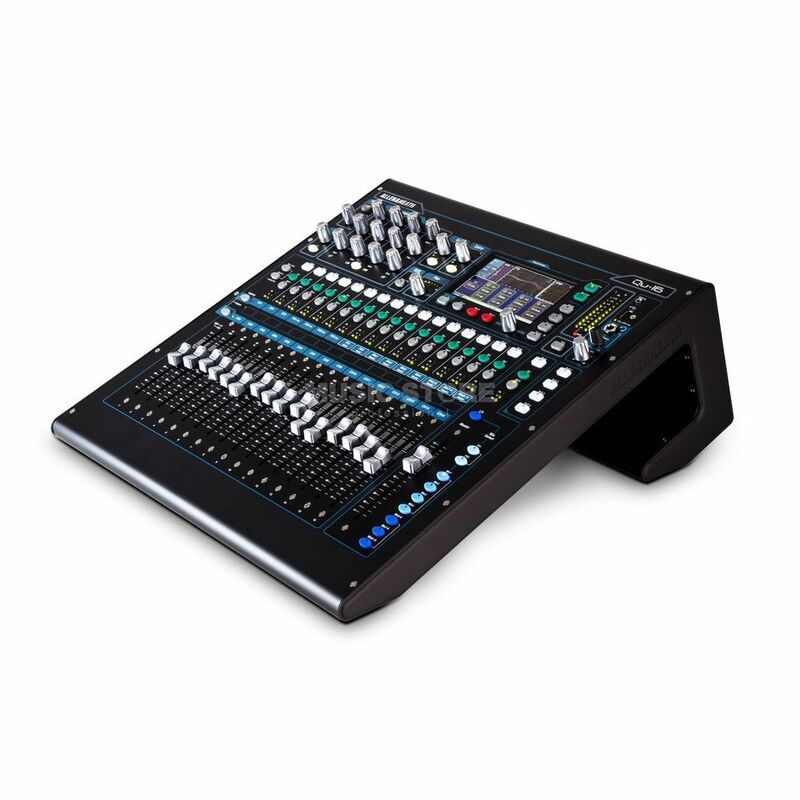 The Allen & Heath Qu-16 Chrome Edition 16-Channel Digital Mixer is a 16-channel digital mixer featuring 12 mix outputs, four FX engines, an AES digital out, moving faders, iOS and Android compatibility, USB audio streaming possibilites and DAW MIDI control. The Qu-16 reshapes digital mixing with innovative design and exceptional functionality combining to create a superb professional mixing experience. Qu-16’s sixteen AnalogiQTM total recall preamps feature zero crossing detection and an advanced padless 1dB step gain stage, closely allied to the DSP for optimal gain accuracy and audio transparency. The analogue signal is captured by high class, low latency 24-bit analogue to digital converters matched to high quality 24bit digital to analogue converters to deliver the required outputs. The 800 x 480, sixteen million colour Touchscreen and its dedicated data encoder form the heart of the Qu-16 interface, providing super-fast, easy access to all settings. Dedicated keys and screen tabs quickly guide you to meter and RTA views, FX racks, channel processing, USB audio control, scenes, setup menus and more. All your key processing tools are presented in a clean layout on the SuperStrip, with 1 function per physical control. The SuperStrip is complemented by an onscreen Touch Channel for intuitive access to full processing parameters without clutter or complex menu structures. Processing for Mono and Stereo inputs includes trim, polarity, HPF, gate, insert, 4 band PEQ, compressor and delay. The main LR and the Mono mixes have controls for Insert, 1/3 octave GEQ, compressor and delay. The Stereo mixes provide Insert, 4-band PEQ, compressor, delay and balance control. Qu-16 features 17 motorized ALPS faders, 16 arranged over two layers, allowing instant access to all channels and masters in a compact space, plus a dedicated master fader which dynamically follows the mix selection. A third, Custom layer is available for ad-hoc user strip layout, where any combination of Inputs, FX Sends, FX Returns and Mix masters can be assigned. Qu-16 can store up to 100 full Scenes for recall at will. Channels and mixes can be made Safe from Scene recall. Custom settings for each EQ, compressor, channel or FX can be saved as Library presets. This lets you store your tried and tested SM58 EQ or reverb pattern and apply it to other channels or shows. Made from 18 gauge, cold-rolled Zintec steel, Qu-16’s distinctive frame is designed for strength, rigidity and ease of rack mounting. Qu-16’s sleek profile generates optimal airflow through the mixer, eliminating the need for any fans. Add the Qu-Pad iPad app to your Qu-16 setup and you’re free to adjust the monitors on stage, roam around the venue whilst tweaking the PA, and then mix the show from the heart of the audience. Qu-Pad connects to the mixer over Wi-Fi and gives instant access to all live mixing parameters and settings.